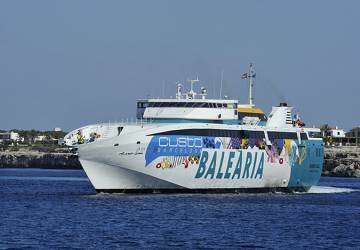 Ramon Llull is a super-fast ferry with capacity for up to 480 passengers and 90 cars. 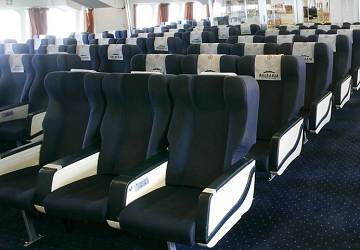 Onboard you’ll find modern facilities including a lounge, seating area, baby changing station, bar/café, left luggage lockers, wheelchair accessible deck, audio visual entertainment and a shop. 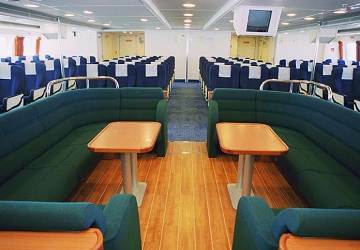 Ramon Lull ferry features 2 reserved seating areas – Sirena which is a standard seating area and Neptune which is a private seating area. Onboard you'll find a a shop where you can buy gifts, cosmetics and perfumes, sweets and more. Please Note: Whilst we have taken great care in making our Ramon Llull guide as accurate as possible, onboard facilities, services and entertainment may vary depending on the date and time of year that you travel, facilities mentioned may change without notification and ferry companies reserve the right to operate vessels other than those mentioned at time of booking without prior notification. The ferry crossing left sharp on outward and inward journeys, a few minutes early to be precise. The crossing was smooth. 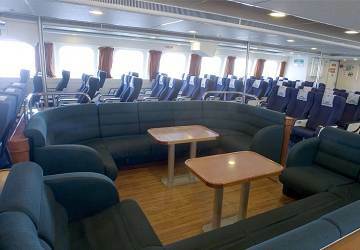 The ferry was clean and had catering services and a shop on board. Plenty of choice for food and drink which was prepared and served well. We were satisfied with the catering. The seating was comfortable and the film that played was just the right length for the crossing. My husband was not near enough the screen to watch, so if interested choose seats carefully. The return trip was quiet and we were not allowed to sit upstairs which we had looked forward to for the view as upstairs was full up on the trip over which was the only disappointment. Embarking and disembarking was efficient and luggage even on the full trip over was stowed and easy to retrieve. Toilets were clean. This ferry route was the perfect option for us as we wanted to drive to Spain from the UK over a few days, then cross over to Ibiza for 10 days. The boats are in good condition and both crossings were punctual. 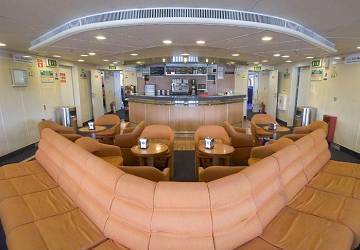 We chose the Neptune lounge as an upgrade for seating which was very worthwhile given the reclining chairs. All in all, a very good experience. Excellent trip Fast and on time . Friendly staff. Would recommend to anyone. No problems with this ferry. Left port on time and arrived on time. Comfortable seating. "Friendly Staff and Good Ship"
Very welcoming staff on a clean ship. Recommended. 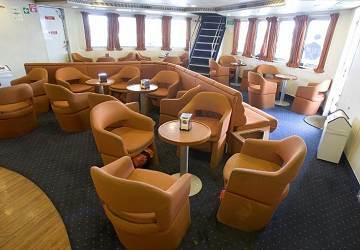 The ferry was clean and well maintained, and the crew were very polite and helpful. Not much of a difference between first class cabin and standard though. "Ferry Trip from Denia to Ibiza and back"
"Good journey with children and car"
All went fairly smoothly. Minor issues managing children as passengers needed to board separately to car & driver, but wasn't too difficult and all other aspects of the journey were well managed and pleasant. It was very easy to book this trip with direct ferries. The ferry was on time and the trip was comfortable. The only criticism I have was the air conditioning on the return journey made the temperature very cold on the ferry. Will definitely use direct ferries again. Both journeys were on time. I think the fares are too high considering the crossing duration. 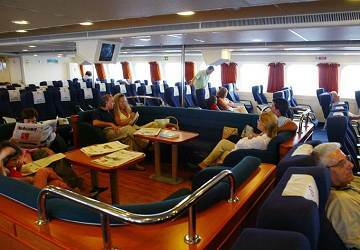 Comparing this service with the ferry to Sardinia, that offers more comfort, the prices are more than double. Unfortunately, if you wish to travel with your car to Formentera, there are no alternatives. 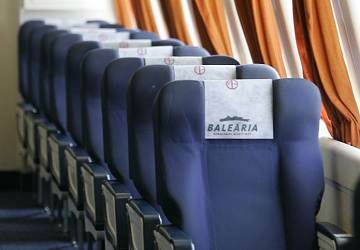 Comfortable seats, nice trip. Slept the whole way. "1st visit to Ibiza in 20 years!" 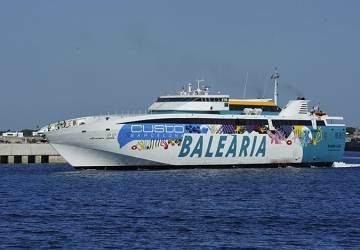 "travel from denia to formentera"
a very comfortable travel, fast and well organized ferry , it was a shame the low quality of the service. very competent and agreeable crew. In the trip of return of 21-24h it was exceeding the functioning of the television since there are no individual earphones.